The thrill of victory, the agony of defeat. Here, we focus on that crushing agony. This has been the greatest 12 months of sports championships we’ve ever seen. That’s the positive way to look at the 2016-17 calendar (starting from April), celebrating the greatness of each one of those comebacks to win it all. On the other hand, all of those comebacks required a collapse by the losing team. Whether it was one play or one game or a full series, each losing team was very close to clinching a title themselves – until they weren’t. Starting with last year’s Final Four and going all the way through Super Bowl LI, we’ve seen some of the most excruciating meltdowns of all time. If you wanted to rank them all in terms of anguish, here’s how you might go about that. 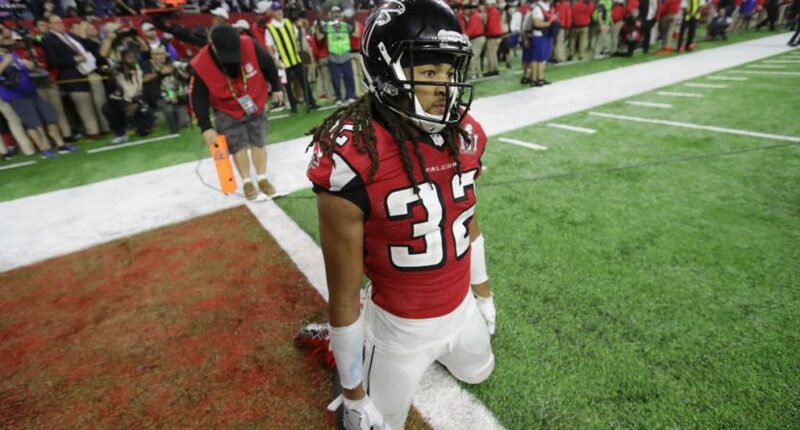 The Falcons were up 28-3 in the third quarter and the Super Bowl was over. Until it wasn’t. And even as the New England Patriots roared back over the course of the fourth quarter, the Falcons still had ample opportunities to kill some clock and make it tougher for New England to force overtime. Up 28-20 with the ball around midfield with five minutes remaining, Matt Ryan threw a miracle pass to Julio Jones – who caught it, somehow! – setting up 1st-and-10 at the opposing 22. A field goal that late could’ve made it an insurmountable 11-point lead late. The Falcons ran the ball for a loss of one, then called two passes. They punted on 4th-and-33. Atlanta, battling both the Pats and the team’s (and city’s) own demons, just had to run the ball and the game was pretty much over with. They were averaging 5.8 yards per carry. Why on earth would you throw? The play-calling, Atlanta’s own history, the 25-point comeback and the (negative) effect any Boston sports win has on the rest of the country makes this a reasonable pick at No. 1. The series that launched a thousand memes. With Golden State up three games to one, the coronation of the “greatest team ever” had already begun for the 73-9 Warriors. Then Draymond Green was suspended, LeBron James got angry and the rest set up an NBA Finals meltdown no one will ever forget. Cleveland methodically chipped away at Golden State’s façade. They played tougher defense and pushed the Warriors around in a Game 5 win. In Game 6 at home, Cleveland bullied the Dubs into a sub-100-point scoring night. For Game 7 in Oakland, LeBron James completed perhaps the greatest defensive play in NBA history, “The Block” on Andre Iguodala. Golden State wouldn’t score for the last four minutes and 39 seconds of the contest. The “greatest team ever” had to face the music after months of dancing, bragging and taunting the league. The Warriors blew a 3-1 lead jokes remain, even halfway through the next NBA season. Riding the good vibes of the Cavaliers ending the city’s long championship drought, the Indians were primed to continue the party with their first World Series title since 1948. Instead, they ended up watching the Chicago Cubs break their own 108-year streak of futility, on the Indians’ home field. Up 3-1, Cleveland needed to win just once with Game 5 on the road, and then two home games ahead of them. The Cubs squeaked by in Game 5, blew them out in Game 6 and then, won Game 7 in rain-soaked extra innings. Making matters worse for the Indians: they actually tied the game by scoring three runs in the bottom of the eighth. They also scored another in the 10th and ended the game with the tying run on the bases. And they’d lost their most recent World Series trip (1997) in extra innings of Game 7 as well. Add in the boasting most Cleveland fans had engaged in since June when the Cavs won and a lot of those 3-1 lead jokes were tossed right back at Indians fans. Mighty North Carolina found itself up by five at halftime, and kept a similar lead through the first few minutes of the second half. Villanova would not only tie, but push themselves all the way to a 10-point lead with under five minutes remaining. But UNC came back. Their assumedly superior talent and coaching and history willed them all the way back into it. The Tar Heels tied the game on a ridiculous Marcus Paige three-pointer with six seconds left. It was pandemonium inside a crowded and very Carolina Blue NRG Stadium in Houston. Kris Jenkins hit his own three at the other end, and the game was over. Villanova won. Heels fans all around the building were sure they were headed to OT and instead, Jenkins and the Wildcats just tore their hearts right out of their chests. Many weren’t even done celebrating the Paige shot before the heartbreak of the defeat landed firmly on top of them. All that stops UNC’s loss from being higher on the list is the program’s long history of success, and recent titles (2005, 2009) to keep them warm in the meantime. The key for Alabama’s dominant 2016 season was to just get up by 14 points. Earn that sort of lead and then just sit on opponents from there, suffocating them with their five-star defensive front and a punishing run game. Things didn’t go according to plan against Clemson, though. The Tigers were within three in the third, then finally grabbed a lead halfway through the fourth quarter. Their quicker pace of play appeared to dictate what the Tide would do more than Alabama’s size could push Clemson around. The Tigers needed a field goal to tie with two minutes left – prime time for ‘Bama to lay right on them and end the game. Clemson ran right past them, and into the end zone with one second left. Alabama and their fans are fine. They just beat Clemson for a title in 2016, and have plenty more championships to celebrate before that one. But the loss, torn from the hands of victory, will smart because of how close it was to heading the other way. Just one second separated them from victory and defeat. This is the only sports year where a loss like that barely registers in the shadow of so many stunning, anguishing collapses.